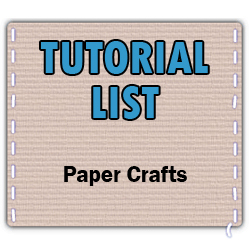 Here are links to an almost completely thorough list of the tutorials that are available in the Paper Crafts, Scrapbooking, and ATCs category. Some tutorials were excluded for lack of pictures and no tutorials listed on other sites were included. If you find another tutorial that you feel should be included here, please reply! If you notice that a link is incorrect or a description is not correct, please let us know either here or in the specific thread. We want this to be as easy to use as possible.